Oow no! Don't put sounds on your web links! But too bad, my wife really wanted it for her site. And so I started thinking how to do this in a browser-compatible way. I have first created a new Flash CS3 document. By now, we have our sound player. To test it, you open the swf file, right-click on it, and then choose "play". The swf will then go to frame 2, and play the sound. Now we can move on to the html file. // then calls the function. 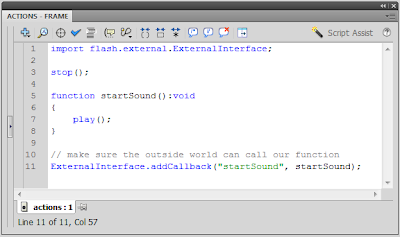 // check if we have a flash document, and if the flash document has a 'startSound' attribute. 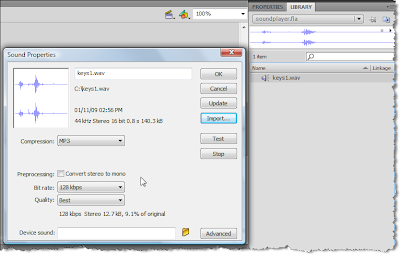 // if so, add a mouse-over event to call the playSound function. // this is used to attach events to objects. // if page has loaded, call the addSoundToLinks function. You can also just download the code here. Or check out the working example online.